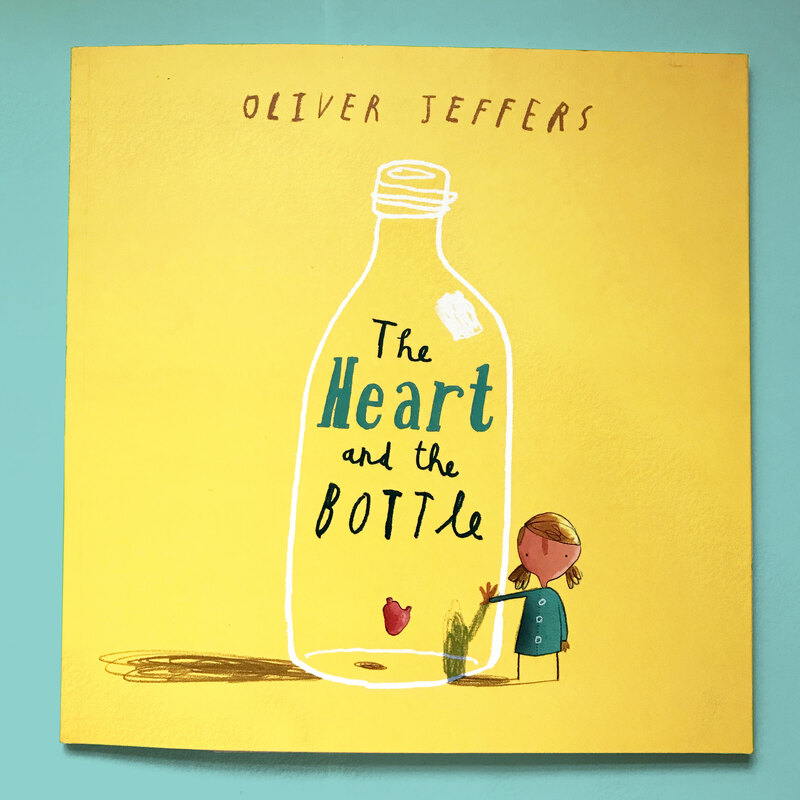 With only week away till Valentine’s Day, I’m sharing a picture book about a matter of heart this month – The Heart and the Bottle by Oliver Jeffers (HerperCollins 2010). Actually this is not a romantic story per se, but this is a story about re-learning how to open up your heart. Award-winning picture book star Oliver Jeffers needs no introduction. He explores themes of love and loss in this very touching tale with his deceivingly simple yet charming, signature illustrations (dotted eyes and stick legs for example). Once there was a girl whose head was filled with all the curiosities of the world, and she shared them with her father who always had the answer to her endless questions. But one day he’s gone from her life forever (his death is poignantly suggested by his empty chair). Not knowing what to deal with this sudden loss, she thought the best thing was to bottle up her feelings – like literally. She put her heart in a bottle. As she grew up with her heart hung around her neck, safe but heavy and awkward, her world was no longer filled with wonder. Without her heart, she even no longer know how to answer to someone smaller and still curious about the world. So she decided to get her heart back out of the bottle. But problem was she didn’t know how. She tried so many things but nothing seemed to work. But the someone smaller and still curious about the world did know a way, and the heart was put back where it came from. How Oliver Jeffers delivers this potentially heavy topic with right amount of sensibility and humour is craftsmanship. The Heart and the Bottle is the sort of book I’d love to create. The main reason why I chose to be a children’s book illustrator is that I find it a rewarding occupation that allows me to be a part of children’s intellectual and emotional developments. Of course I’m not at all in the position to lecture kids. I’m mid-30 and I’m still figuring out this thing called ‘life’. Life is often unfair and the world is far from perfect. If I can make it a bit easier for kids to manoeuvre through life by sharing my experiences and my thoughts on them through my books, then job done. I lost my dad when I was 16, like the girl in the book. It was sudden and I didn’t know what to do with my feelings. I didn’t bottle my heart though, thanks to my supportive family and friends. I stayed open to what the life would bring me. However, I’ve been struggling to find a spark in love department ever since a boy broke my heart badly. It’d been like that for quite a while and I was wondering why, but this book made me realised what’s stopping me from finding the spark. The power of picture books are amazing. Even grownups can learn from them as much as kids can. This heart-warming and life-affirming story is great to read not just in February but anytime of the year and anytime of your life. The book’s beautiful, 50s inspired end papers.